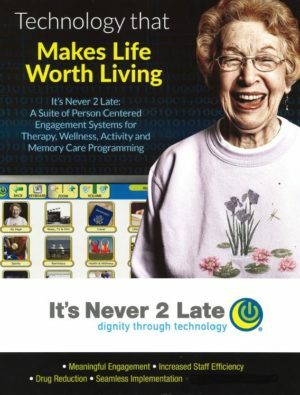 It’s Never 2 Late is a suite of “person centered” touch screen engagement systems that can be used for therapeutic, wellness, activity and memory care programming. It is an interactive program that gives residents many unique interaction and activity opportunities directly related to their interests. This program is a non-drug intervention that reduces the need for psychotropic medications and adds to the quality of life of residents with dementia. We’ve had several generous donors help us reach $4,565.60 of the $10,000 needed to purchase and implement this system in Aspen Village. We are seeking donations from individuals, groups or organizations in any amount to help us reach the $10,000 goal by April 2019. Gifts can be made by check to Frederick Living and mark memo section IN2L or given on-line through our website at: https://frederickliving.org/giving/donate-today/ If giving on our website select “Restricted” under Gift Designation and “Wish List-IN2L” under Campaign.